Ankles.. They roll too easily for some of us. Since I started hiking regularly about 15 years ago, I notice that I can roll my ankles fairly easily. Especially up in the White Mtns in NH where we have done most of our day hiking from 2000 thru 2013. It is rooty and rocky up there, so it is pretty easy to do. Rarely did I ever have any pain for these rolls of the ankle. Then, during our thru hike of the AT in 2011, I rolled my right ankle. Really hard. Stopped me in my tracks. I had just stopped for a couple minutes to grab something out of my pack. After closing the pack, I started walking away, and quickly glanced back at where I had pulled stuff out of my pack – a quick last double check that I didn’t leave anything. Unfortunately I kept walking and there happened to be a fist size rock in my path that I didn’t see. Sprained..That was all it took…very painful. 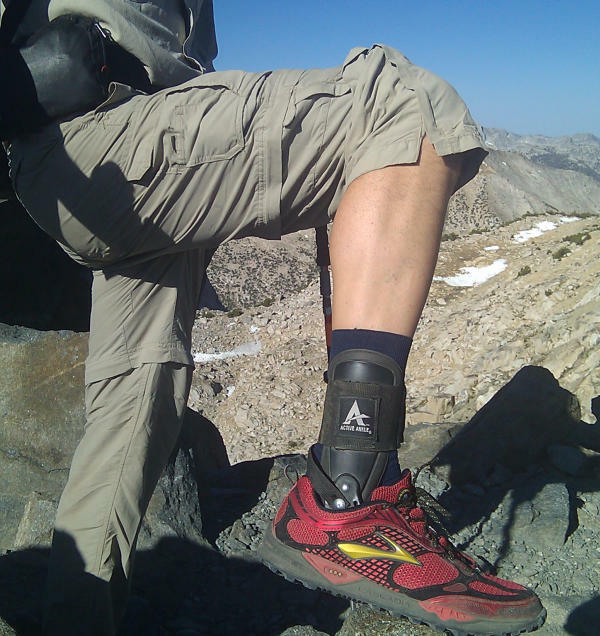 I wore the brace for the rest of the AT, and for nearly all of the PCT the following year. I say ‘nearly all’ with a wee bit of regret. I got a replacement ankle brace mid way on the PCT and my foot was having a hard time getting used to it. I took it off for one afternoon, and as you can guess – sprained the same ankle again – this time on a giant pine cone just north of Sierra City…I think it hurt more this second time..damn. At least I had the brace with me. Even now, a few years later, I have a bit of weakness and pain in that ankle that are particularly noticeable when I do certain stretches. So…I sifted through some YouTube videos to see what I could find about helping the ankle become stronger again. I found two videos from physical therapist/trainer types that are pretty helpful, and use different techniques that are easily done at home. I’ll be working these into my routine over the next few months to see if I can stop some of the ankle rolling this year and avoid sprains completely.